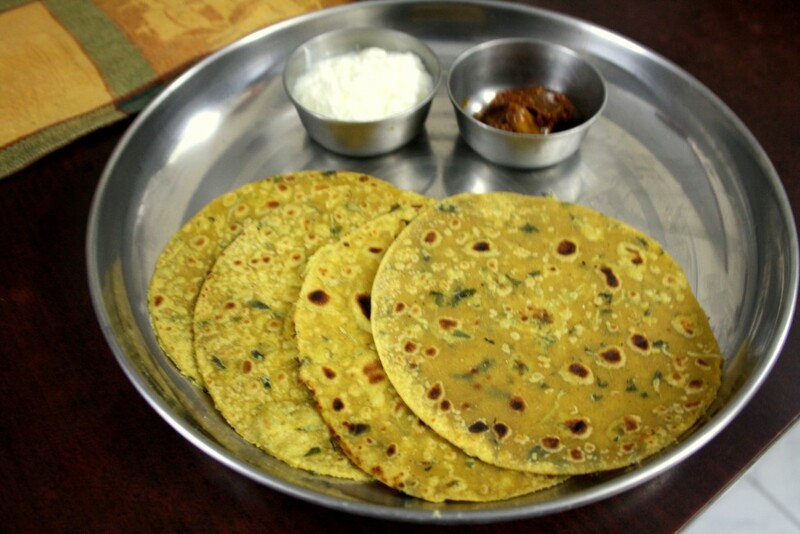 When it came to T, the choice was either Thalipeeth or Thepla. Though I have been reading about both these Indian Breads, only when I decided to make for the series that I really read through them. Thalipeeth is a typical Maharashtrian dish made with a variety of flours along with vegetables. The flour is called as Thalipeeth bhajani, which is not very hard to make at home. Infact I have all the ingredients required for this all the time in my pantry. Only when I decided to make it, that evening wasn’t really conducive to this dish. So the choice fell on Thepla from Gujarat. Theplas are supposed to have longer shelf life and can be had at any time, even as a snack. Well I was all for having it as our dinner without much fuss. 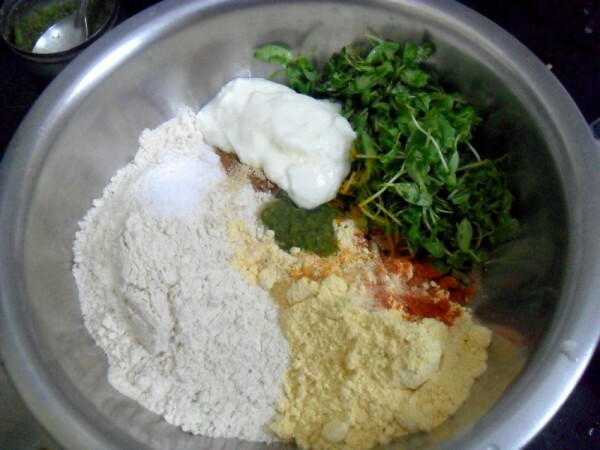 Theplas can be made as plain or with a variety of greens, and vegetables. I had methi with me and realized that Methi Theplas as quite famous. So that’s what I ended up making it. With kids having their quarterly vacation, I am must more pressed to make dishes of their liking. Which naturally gets down to be chocolate recipes. So after a week, if all I can smell only chocolates, I can’t be blamed! The boys design their own games and things to occupy themselves, the latest fad is their chart caps. Peddu seems to have an inbuilt streak of creativity, which I flatter myself to think he inherited all from me..:) He paints and writes, makes handmade stuffs that assume lot of different objects that fancies his thought. Whereas Chinnu is more of his sister’s follower and does what she says and tells him to do. Konda is a leader with two willing followers and her brothers will do whatever she tells. I see this as an opportunity to get things done by the boys. If I want them to eat something they don’t, I convince Konda to tell them. Somehow the moment she says, they are willing to at least try. Sometimes it doesn’t work, however with most things it works. So I am happy. The other day Peddu wrote a letter to his friend, designed an envelope and wanted to post it. For that he said he will want to become postman. For a moment we got so wild, not because we wanted to belittle a postman’s job, but we want to inculcate the thought of thinking big! I know most kids grow up with a thought of becoming a doctor or an Engineer. So it is confirmed that Konda wants to become a heart doctor, Chinnu a pal doctor (Dentist) and Peddu, either a strict police office, occasional will be a postman to deliver his letters to his friends, apart from being a homemaker. We told him that to deliver his letters he need not become a post man, so he agreed he will use the courier service. Thank God for that! 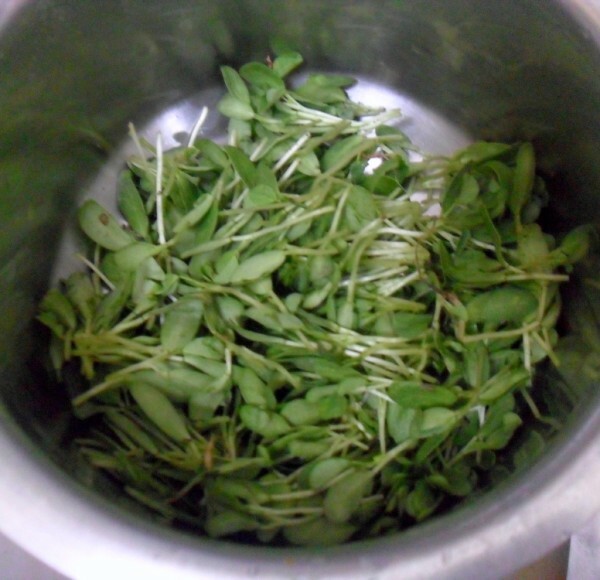 Wash and drain the methi leaves. Chop it roughly to ensure you have small pieces. In a bowl, take all the ingredients and mix everything. Slowly add water to knead to a stiff dough. Cover with a lid and let it rest for 15 – 20 mins. Divide into equal balls, dust and roll out as thin as possible. If you want even equal sized discs, use a lid and cut out discs. Heat a griddle, grease with oil, cook the theplas on both sides. Serve hot with pickle and curds. You can mix in any vegetables like bottle gourd, other green leaves, etc into this. 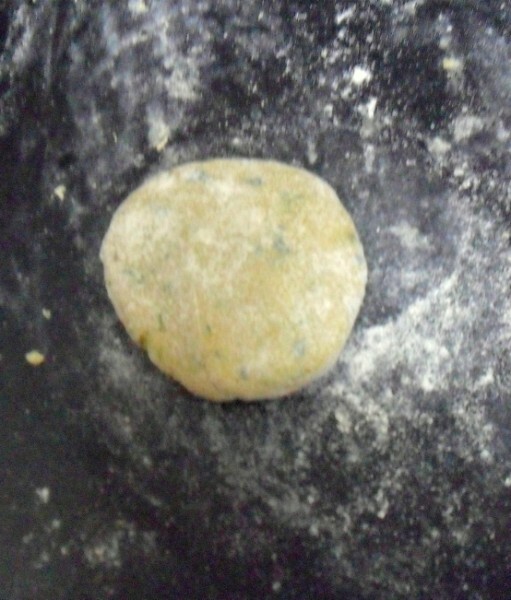 The prepared dough can be stored in refrigerator for couple of days, ensure it is stored in an air tight container. Methi theplas with mango pickle, i can die for this combo..Aromatic theplas..
Valli I enjoy reading these little tales..and smile…truly I can visualize the scenes;))). The theplas look as if store bought..perfect circles..very well done. so flavorful and so delicious!! love them with curd!! I love that perfect round shape of Theplas. 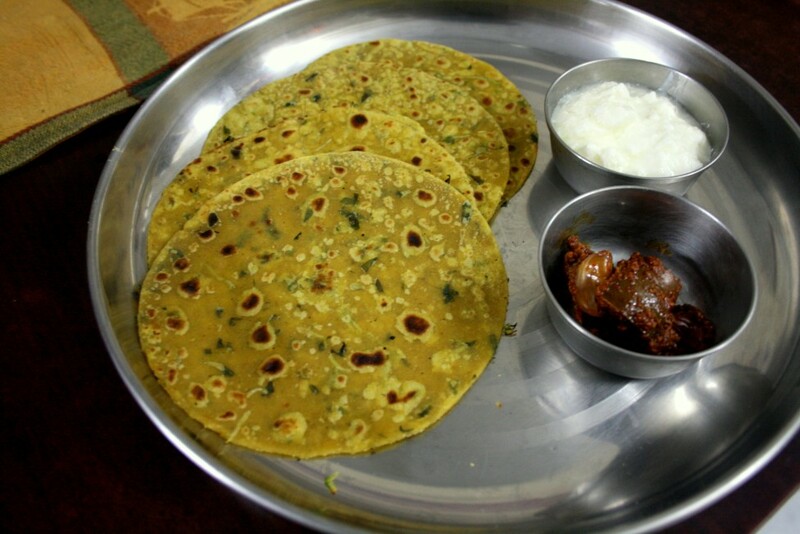 Before BM I was so lost with Theplas and think they are methi Paratha but now I have learnt a lot about them . Enjoyed your chit chat with your son..
Great looking theplas. I am sure they tasted just great. Perfect recipe for the thepla dough. It is wonderful to have young kids at home. Best time you enjoy them. Perfect looking Theplas Valli ! I am tempted to make some tmrw ! I have two brothers and they never used to do anything I ask them to do! Infact they used to do just the opposite!! Love them for the fact that they stay soft longer. Kids can be so entertaining! Imagine wanting to be a postman to deliver letters to friends 🙂 I love both theplas and thalipeeth, the latter being intriduced to me by my Maharashtrian neighbour. 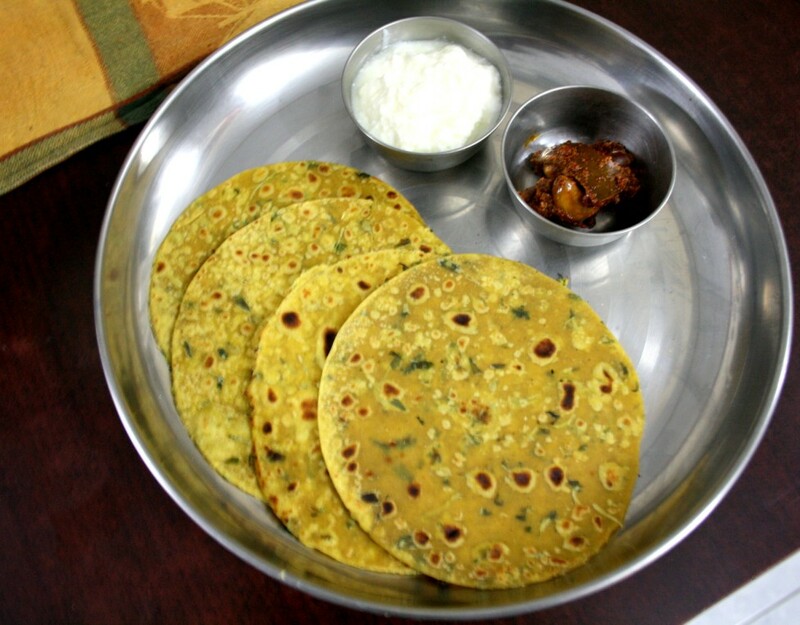 And methi theplas are my personal favourite too! Just now making it for my dinner I love this totally forgot abt this recipe. Thanks for reminding very healthy one. 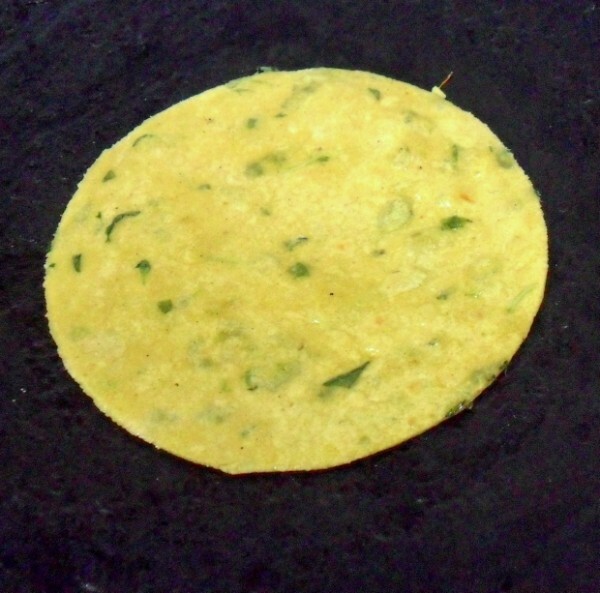 Ha haa my brother used to talk like your son like he wnats to became a bus driver now he is a GEO Scientist… Why I didn't get this idea to make thepla for T good choice looks so inviting that plater. most little boys want to be fireman, postman or policeman at some point. Don't worry it will change as they get older. I tried theplas a long while back with lauki and was not successful. You are reminding me it is time to try again! 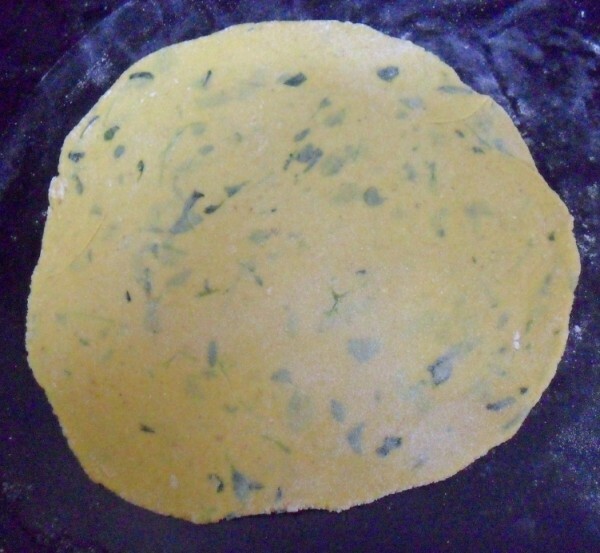 Love those perfectly round theplas.. Methi definitely makes them tasty and nutritious. I can imagine how many professions they will go through before they actually become something 🙂 My son's the same way — one day he's a paleontologist and the next day he's a dump truck driver. Kids are just so innocent and fun. LOL on the postman comment!I remember my nephew telling me he wanted to become an auto driver just like the one he goes to school with!We laughed so much.Now he is an engineer! I can't get my son to do anything let alone ask for my daughter help in this matter.Loved reading your post Srivalli.And the Thepla platter looks so delicious..
Theplas look perfect valli and its fun to know kids thought on everything. Love these theplas. Kids have funny notions about what they want to do when they grow up, right?